Preheat oven to the temperature recommended for your pie dough. Roll pie crust into a 9-inch pie or cake pan. Prick the bottom of the crust, all over, with a fork. Bake according to the recommendation for your pie dough. Toast bread crumbs in a pan on high heat for 3 -5 minutes. Sprinkle about ½ breadcrumbs onto the bottom of the crust and press lightly. In a saucepan, combine creamer and guava paste. Using an immersion blender or by batches (a third at a time) into a regular blender, thoroughly combine the creamer and guava paste. 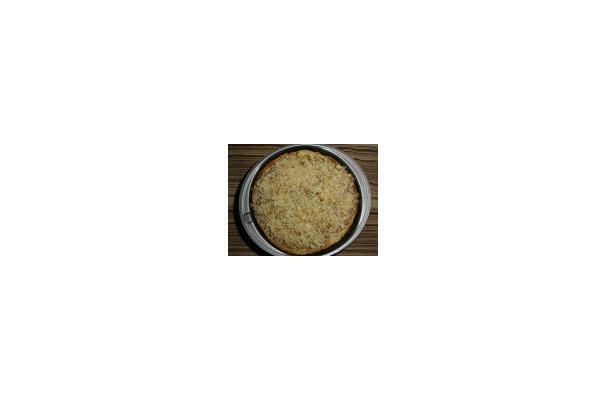 When cool to room temperature, pour into cooled piecrust, top with remaining breadcrumbs. Serve each slice with a dollop of whipped topping, if desired. [From] a kid-friendly menu but not one that children may be entirely familiar with, taking foods that kids usually love...giving them a twist.